Don Quinn was an aspiring commercial artist and cartoonist in the Chicago market. It soon became obvious that his art and drawings weren't going to pay the bills; Magazines that he sent his work to would throw out his drawings but keep the captions. This comic sensibility would not go to waste. 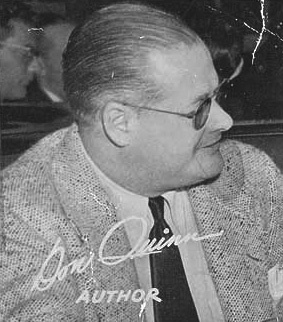 The Jordan's were fortunate to meet Quinn early in their rise to radio fame. Together they would create Smackout. Writer Quinn was a full partner with the stars as they began Fibber McGee and Molly (In 1941 the stars and Quinn split a $6000 paycheck three ways.) Quinn was notorious for delaying the actual writing of the scripts. Many from the show remember that he would wait until the last minute then lock himself in his office with a big plate of sandwiches, a huge pot of coffee, and two cartons of cigarettes. Hours later he would emerge with a funny and fresh script that would be verbally dazzling, and rarely in need of revision. Most other programs, today as well as during the golden age of radio, would have a staff of writers that would spend long days working in concert to craft a script. This makes the stories about Quinn's work habits sound like one of Fibber's tall tales, but it is supported by many associated with the show. Quinn would be the sole writer until 1943, when the talented Phil Leslie was hired as an assistant. Quinn would remain with the show through the end of the 1949-50 seasons, when he left to pursue other interests, including creating the Beulah Show, a spinoff featuring the McGee's maid.